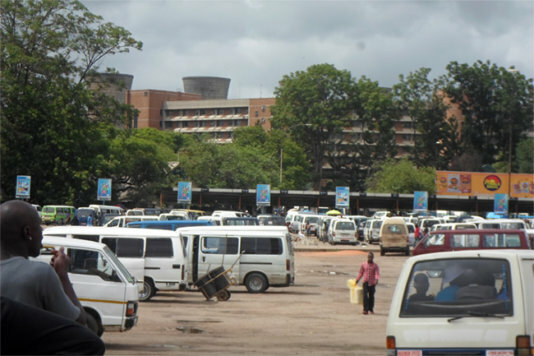 The health of visitors and residents in Bulawayo, Zimbabwe’s second largest city after the capital Harare, is at high risk due to excessive accumulation of litter and fast dwindling hygiene conditions at the city’s busiest commuter omnibus terminus, Basch Terminus, popularly known as Egodini by the locals. Egodini Terminus serves as Bulawayo’s main commuter terminus for commuters who reside in the city’s high-density suburbs. Between 15,000 and 20,000 commuters use the terminus daily on their way to and from the city centre while more than 300 vendors sell their vegetables, fruits and clothes from the terminus. Banana peels, maize cob shells, empty drink and beer cans, plastic papers and plastic bottles are scattered across the terminus pavements. Worms can even be seen crawling out of the decomposing fruit peels and vegetables, while the rotten fruit peels and vegetables emit an unbearable stench, with a potential of repelling customers from vendors who also struggle to earn a living. With the coming of the rainy-season, the amount of litter has not only increased but has now become part and parcel of that which defines and characterises the environment at Egodini Terminus. Now it goes without saying that the garbage piles at the giant terminus have become a breeding ground for bacteria, a huge threat to people’s health. 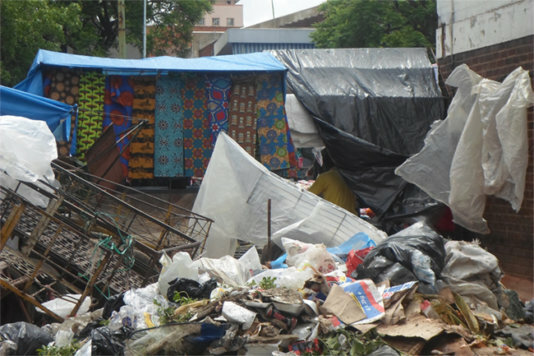 On a visit to Egodini Terminus, this reporter witnessed vendors and commuters dumping litter on the already accumulating refuse piles, an indication that unless an urgent corrective action is taken, a disease outbreak is inevitable. Visitors to Egodini are given a rude welcome by an army of flies that visibly hover over all the places owing to the uncollected litter and putrid stench from the nearby public toilets. Flies and other tiny insects gathered over the fruits and vegetables sold by the vendors, posing a health doom for residents, who now fear for the outbreak of cholera and typhoid at the terminus. Zimbabwe in 2008 suffered an unprecedented cholera outbreak, which claimed many lives as result of deteriorating water infrastructure and poor hygienic standards. Commuters residing in the high-density suburbs rely on fruits and vegetables sold at Egodini for their daily provisions. 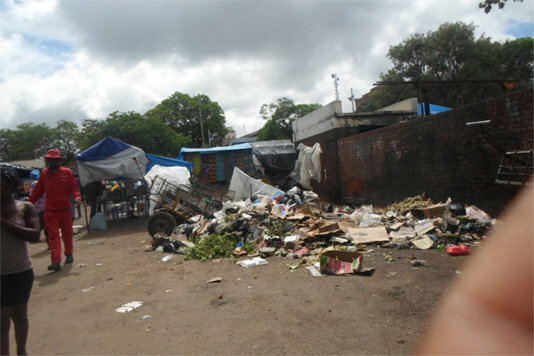 “This terminus is heavily littered and filthy and this is bad for us vendors since we spend most of our time here selling our stuff,” said Lloyd Dube, a vegetable vendor at the terminus. A fruit vendor, Memory Seka, said the environment had become unbearable for those who spend most of their time at the busy terminus, adding the Bulawayo City Council (BCC) should do something about their scenario. “The public toilets here are always dirty and the stench from the toilets is unbearable and highly disturbing,” she bemoaned. Mandla Tshuma, a daily commuter residing at Emganwini suburb, described the sanitary conditions at Egodini as “deplorable” and “unacceptable”. He implored the local authority and residents to keep the place clean and hygienic in order to restore the glory and pride previously attached to the City of Kings and Queens, as Bulawayo is popularly known in Zimbabwe. “The council must be efficient and consistent in the collection of garbage from the terminus and residents must also be highly responsible and avoid deliberately littering the place,” said Tshuma. Bulawayo Mayor Martin Moyo acknowledged litter generation had increased and the council had challenges coping with the pressure. “Litter generation has grown to un-expectable levels as people start to enjoy green maize as a delicacy in the rainy season, the amount of litter at the terminus increases and the bins are easily filled-up with maize shells,” Moyo said. The cash-strapped BCC is struggling to keep up with the ever increasing amount of litter in the city and at Egodini Terminus in particular. “We are short of refuse collection trucks and are also affected by vehicle breakdowns and this obviously impacts heavily on refuse collection by the council,” said Moyo. He blamed litter accumulation on the residents whom he said lacked “a sense of care and cleanliness” as they deliberately throw away their rubbish everywhere at the terminus notwithstanding the city fathers have established garbage disposal sites. The mayor called for more awareness campaigns to educate residents on good environmental stewardship and to “inculcate a culture of responsibility” among the residents. To date, BCC has not adopted sustainable waste management practices such as recycling, something which Moyo was quick to blame on the non-existence of investors into the sector in the city. “No single company has come forward with proposals on setting-up recycling plants in Bulawayo,” said Moyo. Environmental and public health analyst, Surprise Ncube, noted that the economic challenges Zimbabwe is currently grappling with had crippled the operations of municipal authorities in the process compromising service delivery. Ncube argued that, the situation at Egodini Terminus was only a microcosm of the larger problem affecting the Bulawayo municipality and others across Zimbabwe as they struggle to provide essential services to residents who are also defaulting on rates payment due to unemployment and high cost of living. In Zimbabwe littering is criminalised under Section 83 of the Environmental Management Act (Chapter 20:27). The Act makes it an offence to discard, dump or leave any litter on any land, street or road except in a container provided for such purposes or at a place which has specifically been designated for such purposes.